Some apologies amount to someone asking for permission to keep doing something bad. These apologies generally shouldn’t be accepted. If Sarah says, “Actually, it’s not ok. Please back off” or “Yes, you’re mansplaining, please knock it off”, Moe is likely to get angry. The thing is, it’s not ok, and Moe has no intention of stopping. Moe is just apologizing in order to feel ok about doing something he knows is wrong. Sam is a wheelchair user. He’s trying to get through a door. Mary sees him and decides that he needs help. Mary rushes to open the door. As she does so, she says “Oh, sorry, I know I’m supposed to ask first”, with an expectant pause. At this point, Sam may feel pressured to say “It’s ok”, even if the ‘help’ is unwanted and unhelpful. If Sam says, “Yes, you should have asked first. You’re in my way. Please move”, Mary is likely to get angry and say “I was just trying to help!”. In this situation, Mary wasn’t really apologizing. She was asking Sam to give her permission to do something she knows is wrong. Fake Apologizer: *does something they know the other person will object to*. 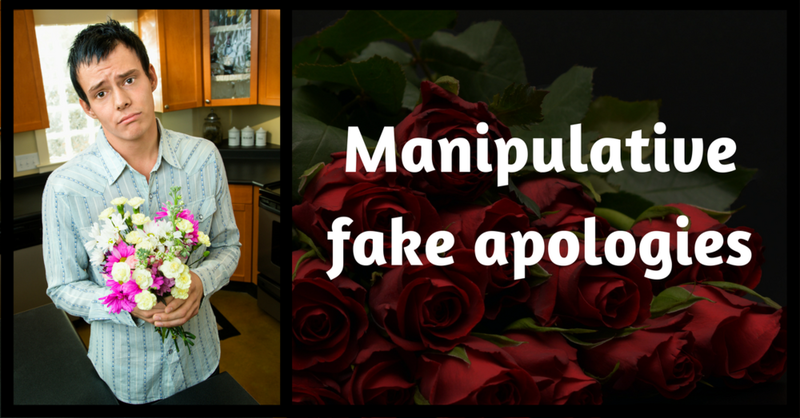 Fake Apologizer: I *said* I was sorry! Fake Apologizer: *storms off, and slams the door in a way that causes the person who refused their intrusive help to fall over*. Tl;dr Sometimes what looks like an apology is really a manipulative demand for validation and permission to do something bad.